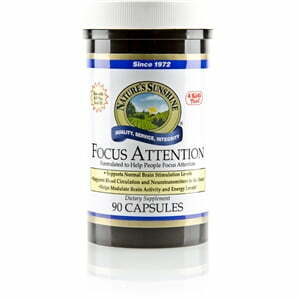 Nature’s Sunshine Focus Attention promotes proper circulation and neurotransmitter levels in the brain to assist in enhancing attention. The formula includes flax seed, ginkgo biloba, DMEA, and melissa officinalis, all nutrients that encourage healthy brain function. 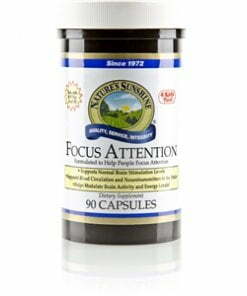 Focus Attention does not over-stimulate but promotes balanced and restful mental activity. Nature’s Sunshine Focus Attention comes in capsules or in a beverage mix. It works best when taken in conjunction with Flax Seed Oil soft gels or liquid. Instructions: Over 12 years: Take two capsules with a meal twice daily. 6-12 years: Take one capsule with a meal twice daily. Under 6 years: Consult your health care professional before using.